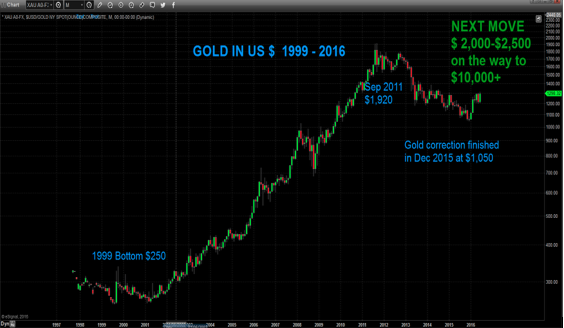 Between 1999, when gold bottomed at $250, and the 2011 peak at $1,920 there was only one major correction lasting 8 months in 2008. The ensuing correction from the 2011 top at $1,920 of almost $900 seemed to take an eternity until it finally finished in December 2015. During those four years it was always clear to me that the uptrend in the precious metals was still intact although I must admit that I did not expect a correction of that duration. But after a long life in markets, patience becomes a virtue that is absolutely essential. If your investment decisions are based on sound principles at the outset, there is no reason to change your opinion because the market takes longer to accomplish what it must do. We bought gold for our own account and for our clients back in 2002 at $300. At that time gold was unloved and undervalued. That is of course the best time to get into a long term strategic investment. But it was never our intention to buy gold as an investment. No, we bought gold because we had evaluated economic and financial risk in the world economy and come to the conclusion that it was unlikely that the system would survive without major defaults, both sovereign and in the banking system. And as we know, the financial system almost went under in 2007-9. With $25 trillion of printed money, credit and guarantees the system was given a temporary stay of execution. But these $25 trillion was just the initial package. Since 2006 global debt has increased by $90 trillion plus unfunded liabilities and derivatives of several hundred trillion dollars. This explosion of debt has confirmed the risks that we saw already back in 2002. Now in June of 2016, I am absolutely certain that the financial system cannot survive intact. Global debt has gone from $20 trillion to $230 trillion, a more than 10 times increase in the last 25 years and none of this debt can be repaid with real money. Governments and central banks have totally run out of ammunition. In their desperate attempts to save the financial system, they have manipulated every single market and financial instrument. They print money, they set false interest rates (now negative), they buy their own debt, they support stock markets and they also sell gold in the paper market. All of this action or deceitful manipulation is just creating bigger bubbles that will eventually lead to a total implosion of the financial system and all the bubble assets such as stocks, bonds and property. In addition, bank stocks in Europe are now showing all the signs of going to zero. Most major banks are down 70-90% since 2006 and many have fallen 25% in the last few days. The European banking system is on the way to bankruptcy. And many US banks like Bank of America and Citigroup are showing the same signs. The coming months will be extremely volatile and disruptive in world financial markets. The problem is that no one is prepared for the coming shock. The world believes that the Shangri-La state that central bankers, led by the Fed, have created in the last 100 years will last forever. A privileged few have accumulated unreal wealth. Most normal people in the West believe that they are better off, not realising that their higher standard of living is based on government debt and deficit spending as well as a massive increase in personal debt. But before the financial system implodes, there will be the most massive money printing programme that the world has ever seen. They will need to print money in a final and futile attempt to save the bankrupt banks. With $1.5 quadrillion in derivatives outstanding, the printing presses (or the computers) will run hot. With Deutsche Bank’s derivatives at $75 trillion and JP Morgan at almost $100 trillion, only those two banks need support at 2.5 times global GDP. It is of course not just the financial system that will need support. Governments will run out of any significant tax revenue and will need to print money for all their expenditure. Soon there will be virtually no social security and no pensions. Remember that Japan for example already today prints 50% of its annual expenditure. So even if the outcome will not be as dire as I fear, we know that the risks are of a magnitude that has never existed in history before. And this is why the few privileged people who have capital or savings too would be wise to prepare for these risks. Throughout history, gold (and sometimes silver) has been the only money that has survived. Every paper or fiat currency has always been destroyed by governments through deficit spending and money printing. In the last 100 years all major currencies have declined 97-99% against gold. It is virtually guaranteed that they will go down the final 1-3% to zero. But it must be remembered that this decline means a 100% fall from here. This final decline of the currencies will be reflected in the gold and silver prices. I am still convinced that we will see gold at $10,000 and silver at $500 and possibly in the next 5 years and that those levels will be reached even with normal inflation. But if we get hyperinflation, we could add quite a few zeros to the price. So from a wealth protection or insurance point of view, it is absolutely essential to own gold and some silver. And although I said that precious metals are primarily for a privileged few, this is actually not the case. In India, virtually everyone owns gold and many of the Chinese save in gold. Any ordinary person can buy say 1 gram gold or more a month. One gram is $40 which is great money people in the world could afford to save monthly. There is of course only one way to own gold and silver from a wealth preservation point of view. Gold must not be held in a bank or in paper form like an ETF. No, gold must be held in physical form and stored outside the banking system. Small amounts can be hidden or put in a personal safe but bigger amounts must be kept in highly secure private vaults outside the banking system and in a politically safe jurisdiction like Switzerland and Singapore. Gold at $1,300 and silver at $18 is a bargain. But the metals will not stay at these low levels for very long. With the correction finished and the next uptrend in place, we could soon see the metals accelerate very fast. The problem is that there is very little physical gold available in the world and we have reached peak gold from a production point of view. With the massive outstanding paper gold position in the system, we will soon see the paper shorts running for cover. Once demand increases, it can only be satisfied by much higher prices. 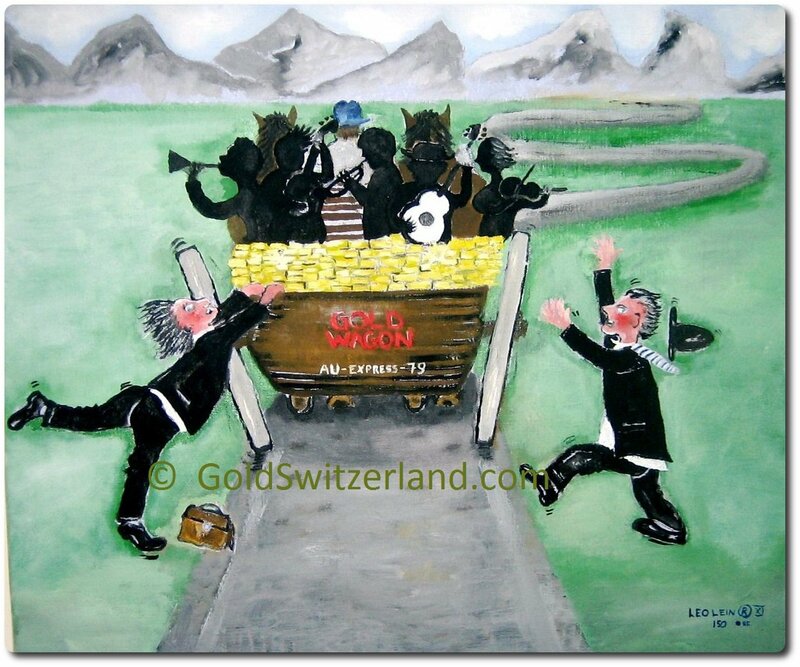 So now is the time to jump on the Goldwagon.